Administrators just need to attach the tags, log into the application, and configure the assets to start enjoying the benefits immediately. Since its inception, Aruba, now a Hewlett Packard Enterprise company, has been a leader in Wi-Fi. Once of the defining characteristics of Aruba that has enabled it to avoid the commoditization curve is that it's always found a way to add value to its solutions above and beyond connectivity. Much of the industry has been competing on price for years, but Aruba has used security, location services, and management as differentiators. I recall a conversation with a CIO a few years ago that told me that he considered Aruba to be a security vendor dressed up as Wi-Fi solution provider. Aruba asset tags -- These are small, BLE (Bluetooth low energy) tags that are about the size of a quarter. The tags differ from traditional BLE beacons in that they are about one-fourth the size and about one-fourth the price. Additionally, beacons are designed for constant communications, with accuracy of about a foot. Tags use considerably less power, communicate with access points much less frequently, and are accurate to about a room. Beacons are used to track things like people in stadiums where an asset tag tracks the location of items such as water pumps and pallet jacks. Asset tag configuration app -- As part of the solution, Aruba has included an easy-to-use graphical configuration app that simplifies the set up, configuration, and ongoing management of tags. The app lets administrators assign names, photos, or other IDs to the tags, making it easier to search for specific assets. All configuration information is stored in a centralized cloud database so there are no local servers to deploy. Updates to Aruba OS and APs -- Aruba has updated the software on the APs and sensors to act as asset tag "observers." The result is the asset tracking network runs as a virtual network within the existing Wi-Fi network. Aruba customers just need to affix the tags and configure the app, and they can leverage their existing wireless network. 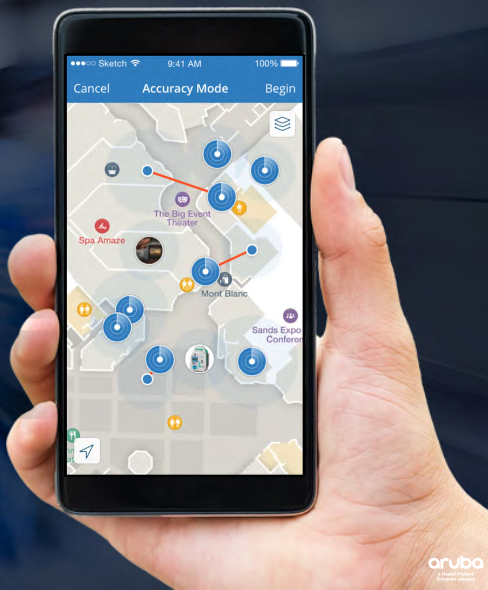 Advancements to Aruba Meridian AppMaker Software -- Aruba AppMaker now has a new SDK and set of APIs so businesses can create their own asset tracking app for iOS or Android. Alternatively, the APIs allow for integration into other applications. As part of the launch, Aruba has extended the solution to a number of existing technology partners, including Stanley Healthcare, Zebra, Raizlabs, VenueNext and Emerge. The company has also opened the program up to new partners in a number of verticals where asset tracking is a problem, such as retail, warehousing, and healthcare. Asset tracking can be a huge problem in many verticals. One hospital I interviewed told me that nurses spend well over 20% of their time just looking for equipment like IV pumps, ultrasound machines, and heart rate monitors. Also, if the required asset can't be found, some clinicians may resort to grabbing one that hasn't gone through the proper sanitation process after its last use, putting patients' health at risk. In fact, hospitals often overbuy medical equipment to account for the fact that 10 to 20% of inventory goes missing on a yearly basis. Another example where asset tagging is a problem is in transportation facilities like airports and train stations. Luggage carts, wheelchairs, and other equipment can be scattered all over facilities. The travel industry is highly competitive and having handicapped people sitting around waiting for a handler to find a wheel chair certainly can be a frustrating experience. There are countless examples across a number of verticals where better asset tracking can improve utilization and/or safety, optimize staff time and help meet compliance mandates. Many organizations use asset stickers, which does nothing other than identify the device as being owned by the facility. Alternatively, setting up an electronic system typically requires a significantly amount of infrastructure and a parallel network to be deployed, which is extremely expensive. Depending on the vertical, asset tracking problems range from an annoyance to something that can have legal implications. The elegance of the Aruba solution is that it leverages the existing wireless network already in place.